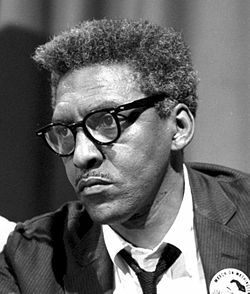 Bayard Rustin was active in the struggle for human rights and economic Justice for over 50 years Born in 1912, he was reared in West Chester, Pennsylvania where he excelled as a student, athlete and musician. He attended Wilberforce University, Cheyney State College, the City College of New York, and the London School of Economics, earning tuition at odd jobs and singing professionally with Josh White’s Carolinians and Leadbelly. A Quaker, Mr. Rustin placed his religious conviction above his musical interests, and in 1941 began a long association with the Fellowship of Reconciliation (FOR). Serving as its Race Relations Secretary, he toured the country conducting Race Relations Institutes designed to facilitate communication and understanding between racial groups. He was active in A. Philip Randolph’, March on Washington Movement, and became the first field secretary of the Congress of Racial Equality (CORE). In 1942 he was dispatched to California by the FOR and the American Friends Service Committee to help protect the property of Japanese-Americans held in detention. In 1943, Mr. Rustic was imprisoned in Lewisburg Penitentiary as a conscientious objector. Mr. Rustin directed A. Philip Randolph’s Committee Against Discrimination In the Armed Forces which was instrumental in securing President Truman’s order eliminating segregation in the armed forces. At Mr. Randolph’s request he was granted temporary leave from his position as Executive Secretary of the War Resisters League, to assist Dr. Martin Luther King, Jr. in the early days of the Montgomery Alabama Bus Boycott. His extensive background in the theory, strategies, and tactics of nonviolent action proved invaluable and were the foundation of his close association with Dr. King. Mr. Rustin organized the Prayer Pilgrimage for Freedom in 1957, The National Youth Marches for Integrated Schools in 1958 and 1959, and was the Deputy Director and chief organizer of the 1963 March on Washington for Jobs and Freedom which, at that time, was the largest demonstration in the nation’s history. Thought by many to be the high point of the Civil Rights movement, the March on Washington created the political climate for the passage of the major civil rights legislation of the 1960s. In 1964 Bayard Rustin helped found the A. Philip Randolph Institute, named for is mentor, the noted labor and civil rights activist. The Institute has 200 local affiliates involved in voter registration drives and programs designed to strengthen relations between the black community and the labor movement. A long-time supporter of worker’s rights, Mr. Rustin participated in many strike’ and was last arrested in 1984 while demonstrating in support of the clerical and technical employee of Yale University During the mid -1960s he participate in the formation of the Recruitment and Training Program (R-T-P) which successfully upgraded and increased minority participation In construction trades. While working to promote democracy at home, Bayard Rustin also supported rights struggles worldwide. In 1945 he organized the FOR’s Free India Committee which championed India?s fight for independence from Great Britain Following the examples of Gandhi and Nehru, with whom he consulted during visit to India, he was frequently arrested for protesting Britain?s colonial rule in Africa. He consulted with Kwame Nkrumah of Ghana and Nnamde Azikewe of Nigeria. At home he helped organize the Committee to Support South Africa Resistance which later became the American Committee on Africa. Mr. Rustin had a long involvement with refugee affairs. As a Vice Chairman o the International Rescue Committee he traveled the world working to secure food, medical care, education, and proper resettlement for refugees. His several visits to Southeast Asia helped to bring the plight of the Vietnamese “boat people” to the attention of the American public. In 1980 he took part in the international “March for Survival” on the Thai-Cambodian border. He was Co-Chairman of the Citizens Commission on Indochinese Refugees, a non-governmental advocacy group working to assist the refugee fleeing Vietnam Cambodia and Laos. In 1982, he helped found the National Emergency Coalition for Haitian Refugees, an organization, which works to protect the rights o Haitians seeking refuge from the poverty and political chaos of their trouble homeland. In 1983, Mr. Rustin and two colleagues made a fact-finding visit to South Africa. Their report, South Africa: Is Peaceful Change Possible? led to the formation of Project South Africa, a program which seeks to broaden Americans? support of groups within South Africa attempting to bring about democratic through peaceful means. A collection of Mr. Rustin’ s essays, Down the Line, was published in 1971. In 1976 he deliver the Radner Lecture at Columbia University which was published under the title Strategies for Freedom The Changing Patterns of Black Protest. At the time of his death in August of 1987, Bayard Rustin was Co-Chairman of the A. Philip Randolph Institute and President of the A. Philip Randolph Educational Fund. He was Chairman of Social Democrats USA, was a member of the United States Holocaust memorial Council, and was a life member of Actor’ Equity. He also served on numerous boards and committees.